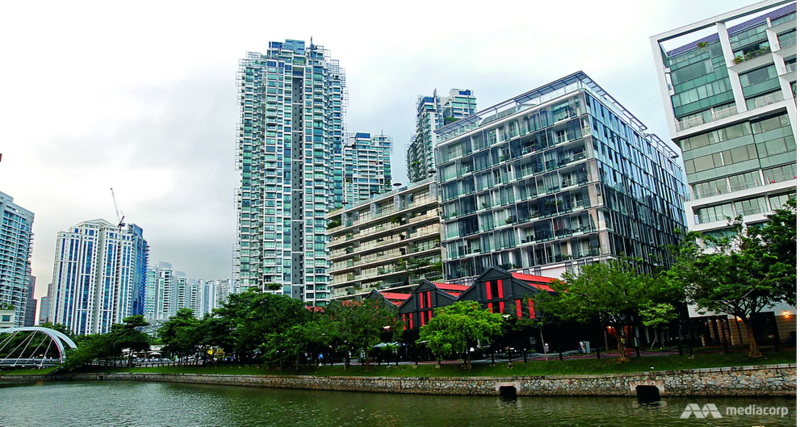 With growing en bloc fever and the market picking up, two experts from the EdgeProp weigh in on whether the uptick in private housing prices is sustainable. SINGAPORE: Lemmings are small rodents typically found in the Scandinavian region, primarily in countries such as Norway and Denmark. Like most mammals, lemmings move and live in groups. These furry little creatures gained popularity because of their supposedly curious behaviour – they have been said to jump off cliffs to commit suicide for no apparent reason. To be labelled a lemming is clearly derogatory as it suggests you’re a mindless follower of a group. Yet we humans are guilty of exhibiting similar herd instincts. The Dutch tulip mania during the 1600s, the dotcom bubble and the US housing crisis are just a handful of examples where mass irrational exuberance led to massive financial losses. 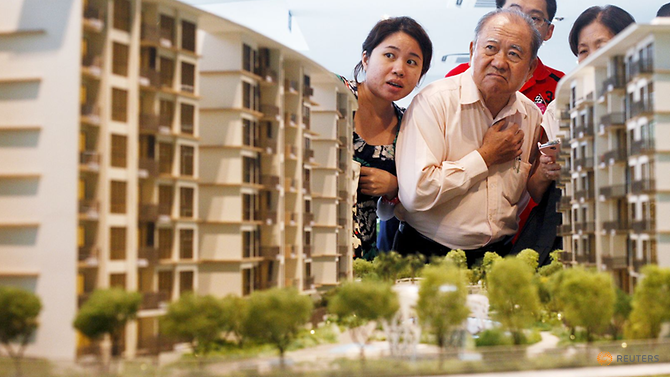 In Singapore, many fear that our own housing market may be showing early signs of irrationality. After years of being in the doldrums, the Singapore property market seems to be finally taking off. Transaction volume in the private housing market has increased 63 per cent year-on-year in August, and prices in prime districts have reached S$3,400 per square foot (psf) for certain projects, such as The Nassim. 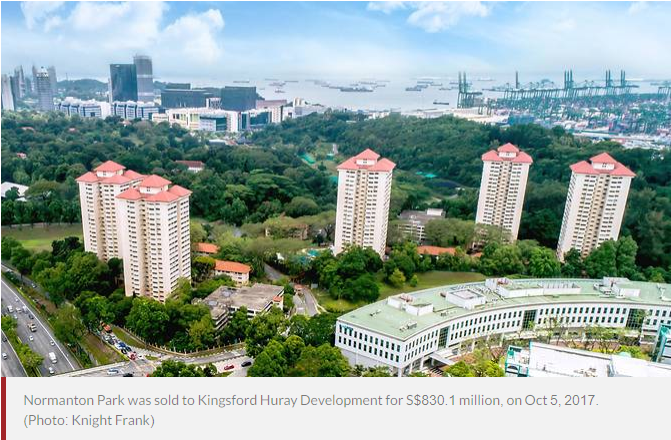 Land-starved developers have heightened a growing collective sale fever, with 15 en bloc deals totalling S$5 billion year-to-date compared to S$1.2 billion in 2016 and S$380 million in 2015. In a recent state tender, a private housing site at Serangoon North Avenue 1 fetched S$965 per sq ft per plot ratio (psf ppr). The price was on par with those of Alex Residences and The Crest in Bukit Merah. The elevated land prices will also likely translate into higher selling prices for future launches. Condominium units at the Serangoon North Avenue 1 site, for example, could be launched at prices north of S$1,600 psf. These figures could be alarming, particularly for first-timers seeking to enter the private housing market. They also lead us to question, are we on the cusp of a property market bubble? ARE HOMES STILL AFFORDABLE AND RENTAL YIELDS GOOD? In assessing whether the current fever in the property market is sustainable, experts look at two key indicators. One is affordability, measured by a price-to-income ratio. Over the past decade, the steepest price hikes of 33 per cent and 14 per cent for condominiums, tell-tale signs of a property bubble, were seen in 2007 and 2010, respectively. Then, property prices fell 26 per cent peak-to-trough in 2008 while the Government stepped in with the first of many cooling measures in 2010. 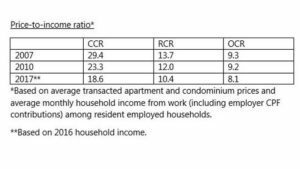 In 2007, the average condominium prices in the Core Central Region (CCR) were 29.4 times the average household income, 13.7 times in the Rest of Central Region (RCR) and 9.3 times in the Outside Central Region (OCR). In 2010, they were 23.3, 12.0 and 9.2 times respectively. 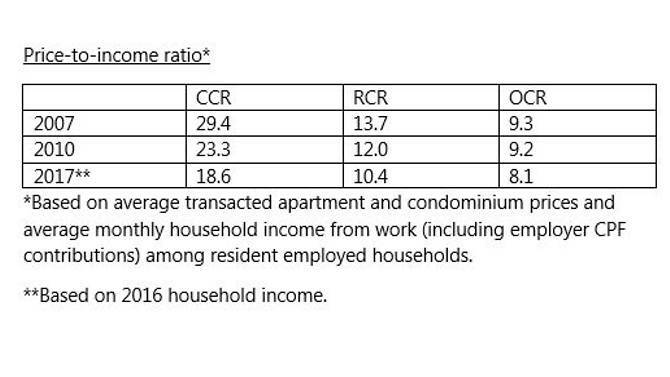 With prices trending down and incomes improving since mid-2013, the affordability ratio has improved significantly and currently stands at around 18.6 times in the CCR, 10.4 times in the RCR and 8.1 times in the OCR. These are also among the lowest in the past decade. Another indicator of a sustainable housing market is rental yield. A hike in prices not matched by rising rents suggests that a property is overvalued.Rental yields in 2007 and 2010 were at healthy levels, because of tight housing supply. 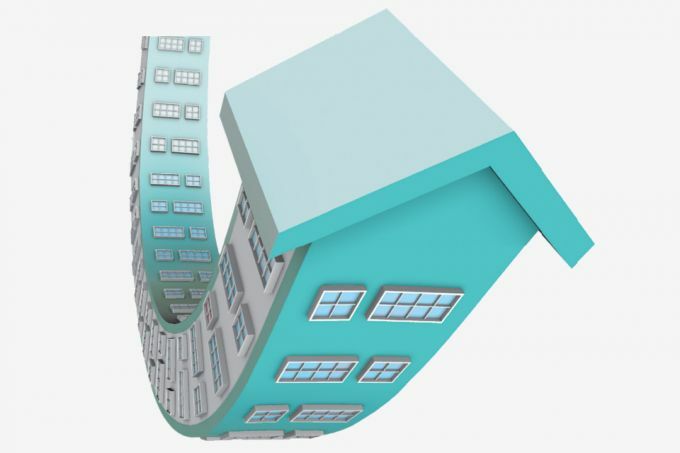 Completed condominium units totalled only 1,398 in 2007 and 8,509 in 2010 compared to the past decade’s average of 11,053. Vacancy rates were low, averaging just 5.6 per cent in both years. One piece of data stands out today. Rental yields in the OCR are at a new low since official data was first made available in 2004. This signals that suburban apartments and condominiums are overvalued as rental investments. 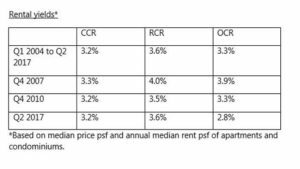 In the second quarter of 2017, rental yields of apartments and condominiums in the OCR reached 2.8 per cent, compared with a historical average of 3.3 per cent since the first quarter of 2004. 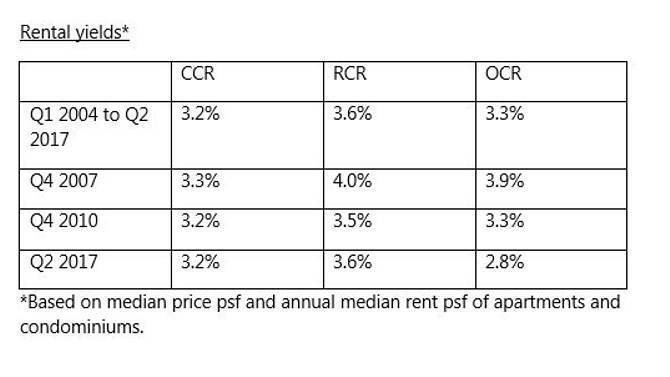 Rental yields were around 3.2 per cent in the CCR and 3.6 per cent in the RCR, on par with their historical averages. This rental weakness in the OCR has been observed in projects facing new competition in their vicinity. Notably, the bulk of new supply in the OCR has been in Bedok, Sengkang, Clementi, Pasir Ris, Jurong East and Jurong West with a total of 6,690 units coming on stream between the second quarter of 2016 and the second quarter of 2017. 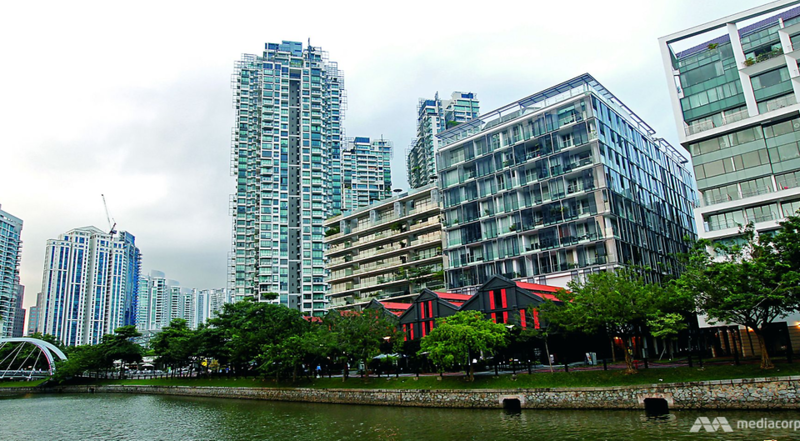 Two-bedroom rents at H2O Residences, for example, fell 4 per cent quarter-on-quarter in the second quarter of 2017, with the influx of new projects in Sengkang including Jewel@Buangkok (616 units), La Fiesta (810 units), Riversails (920 units), Riverbank@Fernvale (555 units) and Rivertrees Residences (495 units). Separately, two-bedroom rents at Casa Merah and Optima@Tanah Merah were down 5 per cent and 6 per cent quarter-on-quarter respectively in the second quarter of 2017. Recently completed projects in the neighbourhood include eCO (748 units), The Glades (726 units) and Urban Vista (582 units). It seems these new developments have dampened rental market yields in those areas, as a huge supply of potential landlords compete fiercely among each other. Consequently, the completion of these new developments may discourage those seeking rental investments from entering the market in these areas, allowing the market in OCR private property to re-adjust and bring rental yields closer in line with historical averages. With most cooling measures set to remain, a runaway in private home prices is an unlikely prospect in the near future.Several factors that fuelled the property bubbles in 2007 and 2010 are noticeably absent. The number of sub-sale caveats for apartments and condominiums, a proxy of speculative activities, has fallen dramatically from 5,127 in 2007 and 3,321 in 2010, to just 480 in 2016 and 248 in the first to third quarters of 2017, primarily due to the introduction of the Seller’s Stamp Duty. Purchases by foreign nationals, who were blamed for the inflated property prices in cities such as Sydney, Melbourne and Toronto, are now at a fraction of 2007 and 2010 levels. There were fewer than 4,000 caveats lodged by foreign purchasers between the first and third quarters of this year, compared with 8,291 and 6,784 caveats in the same period in 2007 and 2010 respectively. The recent improvement in private home prices can essentially be drilled down to two factors – tapering land supply and pent-up demand. Nearly 30 private housing sites were launched for sale in 2011. In comparison, fewer than 10 private housing sites were launched for sale in 2016. The Government had also unexpectedly stuck to its tightly calibrated approach in releasing land under the second half of 2017 Government Land Sales programme despite the rebound in collective sale activities. The supply of 2,840 housing units on the Confirmed List is just slightly higher than the first half of 2017’s 2,330 units. Transaction volume and prices also received a boost from home buyers jaded from waiting on the sidelines for prices to cool. They were especially spurred after the Government reiterated its stance against unwinding existing cooling measures.Ultimately, all things considered, we do not expect private housing prices to go on a precarious upward trajectory. Instead, as the market recalibrates, private housing prices are likely to be sustainable based on current levels. There’s a happy ending to the story on lemmings. Science has shown that, contrary to popular belief, lemmings are not the mindless, suicidal creatures they were once thought to be. Their survival instinct enables them to migrate en masse to new habitats to overcome population density challenges. In fact, lemmings are great swimmers; they jumped off cliffs not to commit suicide but to cross lakes and rivers in search of greener pastures. Similarly, in this instance, it seems rationality prevails in the Singapore property market. Bernard Tong is CEO of EdgeProp (previously known as The Edge Property) Singapore, a portal that provides users with property news, listings, data and analyses. Feily Sofian is head of research at EdgeProp Singapore.